Not so long ago, when Kristen Stewart was still turning in listless performances in the unbearable Twilight saga, it would have been very hard to imagine her winning a César (the French Oscar) – or any acting award, other than a Razzie – but win one she did, playing Valentine, personal assistant to Maria Enders (Juliette Binoche, last seen bringing much needed quality to the opening of last year’s Godzilla), star of stage and screen. It is well deserved. I have not always appreciated the films of Olivier Assayas – his well-regarded Clean, a movie about overcoming addiction, was particularly off-putting – but I have always admired the ambition of his intentions and his refusal to stay trapped in any one genre. Whether working in period melodrama (Les destinées), stylish neo-noir (Demonlover) or television biopics (his absolutely terrific Carlos), Assayas constantly tests the boundaries of visual storytelling. And now, in Clouds of Sils Maria, with the help of Stewart and Binoche – both at the top of their game – he gives us a profound meditation on time, memory and art. The movie opens with Valentine and Maria traveling, by train, to Zurich, where Maria is due to accept an award at a tribute to Wilhelm Melchior, the man who, 20 years earlier, launched her career by casting her in the starring role of his play Maloja Snake (the title refers to a cloud-based weather phenomenon in the Engadine valley of the Southeastern Swiss Alps), and later in the movie adaptation, which he also directed. Before they arrive at their destination, however, Wilhelm dies, of an apparent heart attack, and so the tribute turns into a memorial service. In Zurich, a young theater director, Klaus, approaches Maria about acting in a new version of Maloja Snake, but with a twist. The play has two female leads: Sigrid and Helena. Helena is the older woman who hires the much younger Sigrid as her personal assistant, falls in love with her, and then commits suicide when Sigrid abandons her to move on to greener pastures. Maria originated the part of Sigrid, but now Klaus wants her to play Helena, and claims that Wilhelm, at the time of his death, had been working on a sequel to his original play in which Sigrid eventually became Helena. Initially repulsed by the idea, Maria – who we see otherwise being asked to star in Hollywood CGI blockbusters – eventually comes around, and the bulk of the film centers on her rehearsing for the new production, with Valentine doubling for Sigrid as they read lines. Doubling. That’s a big leitmotif here. As Maria and Valentine rehearse the new production, art and life intersect as the intensity of their own relationship begins to mirror that within the play. Life imitates art. Art also imitates life, as Stewart plays a character looking, outside in, at the world of movie stars, including not only Binoche, but also Chloë Grace Moretz (If I Stay), who plays Jo-Ann Ellis, the Hollywood ingénue set to star as Sigrid in the new stage show. Jo-Ann’s blockbuster movies, as well as her relationship scandals, mirror those of the real-life Stewart. Not only do the boundaries of art and life collide, but the film often seems to suggest that life means nothing to these people unless it is framed by art and artifice: we see them on their iPads and other devices, and even when Maria and Valentine sit in front of majestic alpine views, all they can talk about is the play. The first time we see the actual “maloja snake” phenomenon, it is through a 1924 silent documentary by Arnold Fanck, a copy of which Wilhelm owned and watched repeatedly. Life means so much more when artistically composed. Time and memory are also major themes. Past and present converge as Valentine and Maria hike the mountains of Sils Maria – they are staying in Wilhelm’s house, which his widow has vacated to allow them to perhaps feel his spirit as they rehearse – walking paths, both literal and metaphorical, that Maria once trod as a younger woman. We’re never sure how much of Maria’s feelings for Valentine – mostly platonic – come from her own experience playing Sigrid; from her new relationship, as Helena, to the text; or from the actual dynamic of boss to employee, friend to friend. It doesn’t matter. What does matter are the constant echoes of time past, present and future (and we’re in the Alps, so there are literal echoes, as well). Stewart, as the repository of all of this projection, holds her own against Binoche, and then some. She still has those awkward gangly movements that made her such an unlikely love interest for vampires in the Twilight films, but here, combined with the burning intelligence of her eyes, that awkwardness serves to showcase a young woman on the verge of finding (and asserting) herself. In another universe, she might have even been Maria, taking a different path. 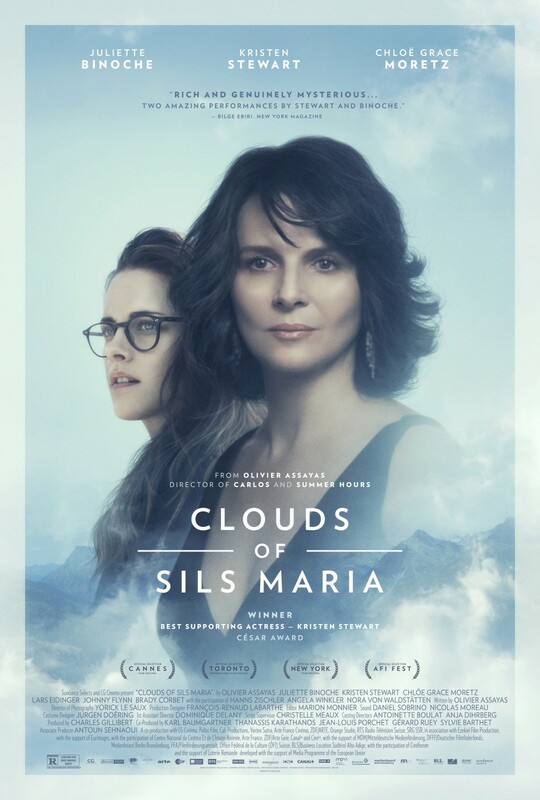 And speaking of other universes and recurring time, Sils Maria just happens to be where Friedrich Nietzsche came up with his seminal idea of the eternal recurrence (is it just a coincidence that Maria Enders takes her first name from here? ), which adds yet another layer of meaning to deconstruct. It’s an extraordinarily rich film, a meta-text ripe for analysis. I highly recommend. Pingback: Chris Reed Film review’Equals’.. – HUSHTRUTH…….